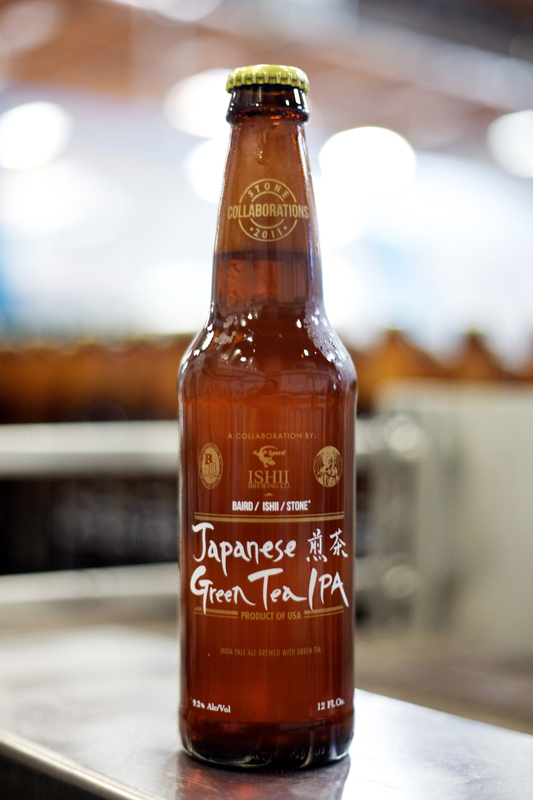 This is a collaboration beer with Baird / Ishii / Stone Japanese Green Tea IPA as a benefit for Japanese tsunami relief. Bryan Baird—brewmaster & founder of Numazu, Japan’s Baird Brewing—and Toshi Ishii—former Stone brewer (1998-2001) & founder of Guam’s Ishii Brewing Co.—joined Stone Head Brewer Mitch Steele in crafting this truly unique beer. I returned to the office after my lunchtime beer shopping excursion, hid my beers in the back of the break room fridge, and went back to work eagerly awaiting the end of business. My workday seemed to fly by in anticipation of tasting the Green Tea IPA that evening. I went home, fixed up a tri-tip salad, and poured myself a beer. I popped the cap and poured the 12 oz. Green Tea IPA into a pint glass. It had a nice light caramel color and almost no head. I’ve had regular green tea before, both hot and iced, so my expectations were already set accordingly. But once I got a nose of this beer my expectations changed. I could already tell this was going to be an interesting one. It didn’t smell like an India Pale Ale. I really wanted to like this beer. It’s a sweet IPA, probably from the Sencha tea. It’s not very complex, and the citrus notes were missing. I’m not going to rush out and buy more of this. I bet this is going to be one of those that disappears from the shelves quickly, mainly because it’s a collaboration beer, and secondly because it’s a fundraiser for the Tsunami relief, but not because it’s an amazing beer. If your bottle shop carries Stone Collaboration beers, then it’s available near you. Go pick one up and let us know your thoughts. This entry was posted in Craft Brew, IPA, Review and tagged 9.2%, Green Tea, IPA, Japanese, review, Stone by Erik. Bookmark the permalink.